A disturbing tale of identity and deception set in 1950s Toronto. That Rafe Jonason’s life didn’t end when he smashed up his car was something of a miracle; on that everyone agreed. However, the devoted husband and pillar of the community emerges from hospital a very different man. Coarse and intolerant, this new Rafe drinks away his days, showing no interest in returning to work. Worst of all, he doesn’t appear to recognize or so much as remember his loving wife Julie. Tension and suspicion within the couple’s Rosedale mansion grow after it is learned that Rafe wasn’t alone in the car that night. Is it that Julie never truly knew her husband? Or might it be that this man isn’t Rafe Jonason at all? 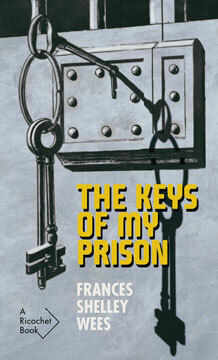 Originally published in 1956 by Doubleday, The Keys of My Prison is one of several suspense novels Wees set in Toronto. This Ricochet Books edition marks its return to print after fifty years. Frances Shelley Wees (1902-1982) was born Frances Shelley Johnson in Gresham, Oregon, immigrating to Canada as a teenager. Wees worked as a schoolteacher in Saskatoon, and later attended the University of Alberta. Her first published novel, The Maestro Murders (1931), was followed by more nearly twenty others, primarily mysteries and romances. Wees lived most of her adult life in Ontario, moving to the West Coast the year before she died. Rosemary Aubert is the award-winning author of the Ellis Portal mystery series. Her work is based on her experience as a criminologist. She lives in Toronto. 208 pp 7" x 4.25"